I have heard people thinning latex caulking with water and painting it on to seal the cloth or thinning Weldbond and painting it on. My question is, what is the recommended way to seal the surrounds and have any of you had any experience with any of the methods I mentioned- (or do you have a better way)? I don't want to change the surround as they are still intact and seems to be sound, except for the fishnet effect. White silicone-based caulking is thinned with water to a paintable consistency. Put the driver on a lazy susan for best results. Paint it on while spinning the speaker and be sure to spread it down a bit onto the cone. Check the backside to be sure too much hasn't seeped through. people have written here about a product for this purpose from Orange County Speaker. I use a product from M_Sound--it is included in their refoam kits and is used to attach the foam, but can also be used for the purpose you describe, and it can be thinned with water to the consistency of skim milk and painted on the paper woofer cone. What if a white rubber based paint was used? Many years ago on a service call at a small print shop, I saw them making up scratch pads, for their own use. They had some sort of vise and with an inch or two of evenly cut paper exposed, they painted several coats of rubber, I believe it was a rubber based paint. OK, I took some water base bathroom sealer (Mono) and thinned it down with a bit of water and black acrylic craft paint. I tried Carl's suggestion of spinning it on a lazy susan but it wasn't working too well, so I just painted it free hand. It took two thin coats but there are no more fishnet holes. At a distance it kind of looks like new foam surrounds! It feels very pliable and a touch stiffer than previous, so I think that at least they are closer to factory condition than before. So chuffed. Now to close it up so my boy can listen to Barney again. One needs to use care when recoating cloth surrounds. If a thick layer is applied, the free resonance frequency will increase. It should remain 30-32 Hz. 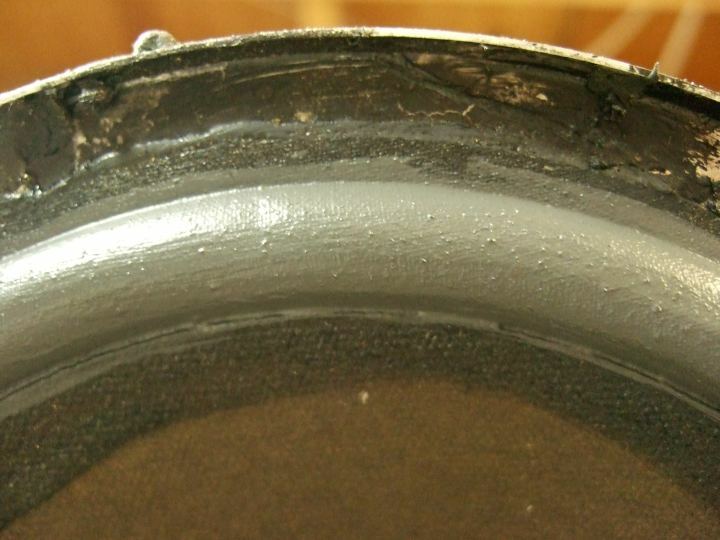 I have a couple of 4x drivers that were coated with a black rubber compound and measure 60-65 Hz. This of course raises the system resonance and its -3 dB cutoff frequency. The latex cement provided for attaching foam surrounds (highly thinned) seems to be the best material available, as Loctite butyl rubber sealer is no longer sold. 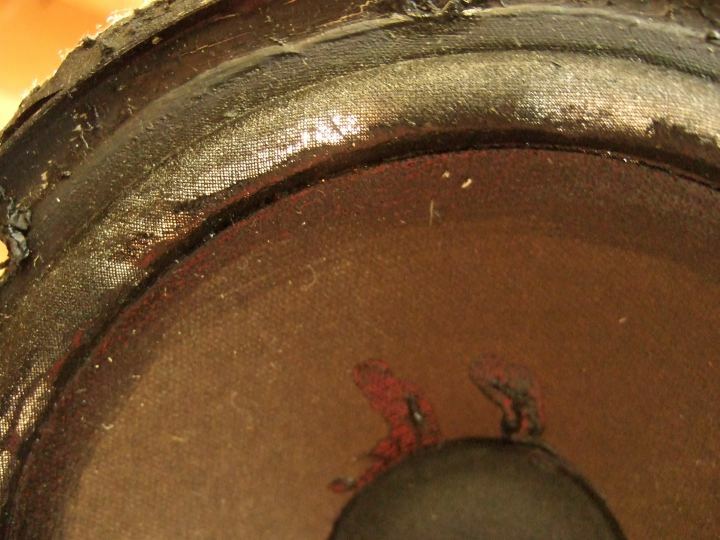 Personally, I only recoat if the woofer leaks when it is depressed and then only on the regions that appear to be transparent. Best thin to the viscosity of water and apply two coats rather than too thick and ruined forever. Perhaps a couple of shots of Armorall to seal the remaining butyl rubber. That makes sense, but I have no way to measure the free air resonance. But when I reassembled everything and sealed it up the difference was astonishing. Well worth the excercise. Really chuffed. I'm on a roll now so I'm going to open up my AR-3's, AR-2ax's and for good measure, my Dynaco A25's. I look for the surround sealer though. Stan, I'm glad to hear your first attempt at sealing the 4x cloth surrounds was a success. If you plan to do more, the commercial stuff mentioned by others here is sold by Orange County Speaker Repair. 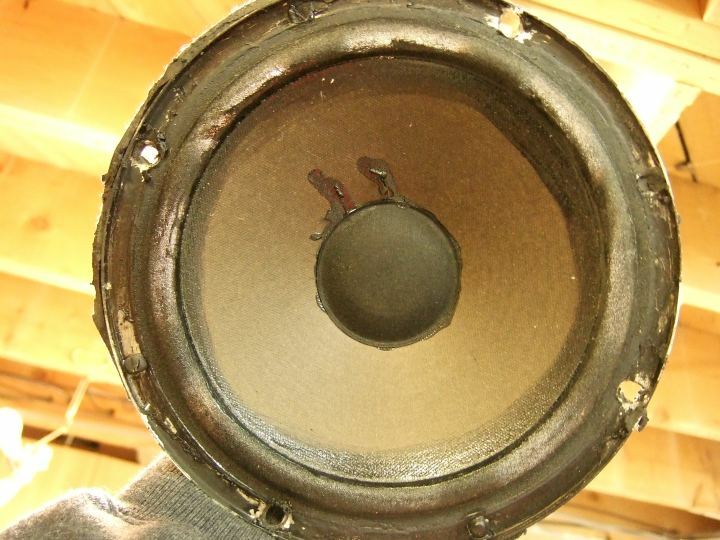 Call them and ask for the white stuff used by reconers to seal cloth surrounds on pro woofers. It's a water-based rubber adhesive that will dry clear. If you live in a normally cold place this winter be sure to order it early so it doesn't freeze in transit. 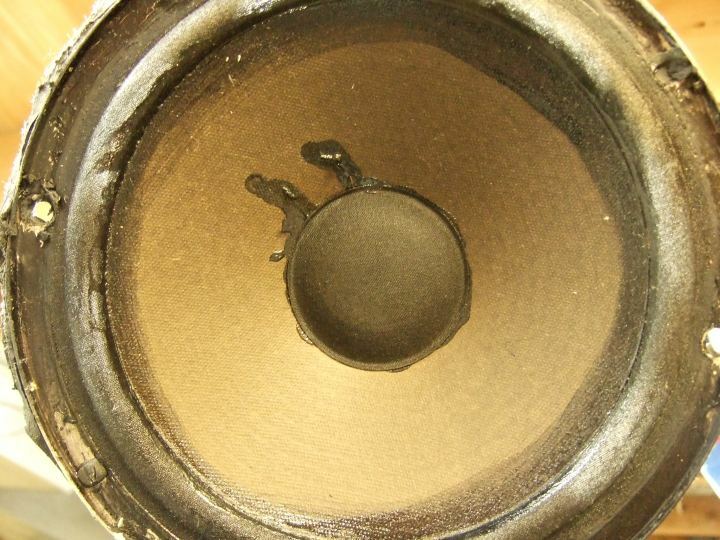 When you get to those other speakers with cloth surrounds, you can check for leakage without instrumentation by holding a lit match or cigarette near the surround while you depress the cone manually. Do this with the speaker lying on its back so there will be no chance of damage from the heat. If those have the same apparent fish-net appearance, there is a good chance you'll see the flame or smoke dance around. And here is the link for M_Sound. I assume his is the same stuff as sold by Orange County. You'll get helpful advice, too. btw--I don't think latex paint is a good idea. This white glue remains flexible "forever". Paint gets hard. I have measured resulting fs after trying a number of surround sealants. As John commented, great care must be taken. It doesn't take much to raise fs 10hz or more, which will effectively make our superb low frequency reproducers become very ordinary. I would not recommend "glues" of ANY type, diluted or otherwise, (even the "flexible" kind) as they tend to become too stiff and DO negatively affect fs in my experience. The diluted latex caulk works, but must be used very sparingly. Another commercial product I have successfully used on cloth and foam surrounds is called "Foam Guard", sold by Simply Speakers. It is a rubber based sealant. Gents, thanks for all your suggestions and advice. I am going to try this product as it seems to be made for speakers. When I get it I'll try it on a piece of cloth first to see how flexible it is after it dries. That should work. It's probably the same stuff OC Speaker Repair sells. Good idea trying it out on some fabric first. >flexible it is after it dries. The latex listed first is likely what PE and others are selling. 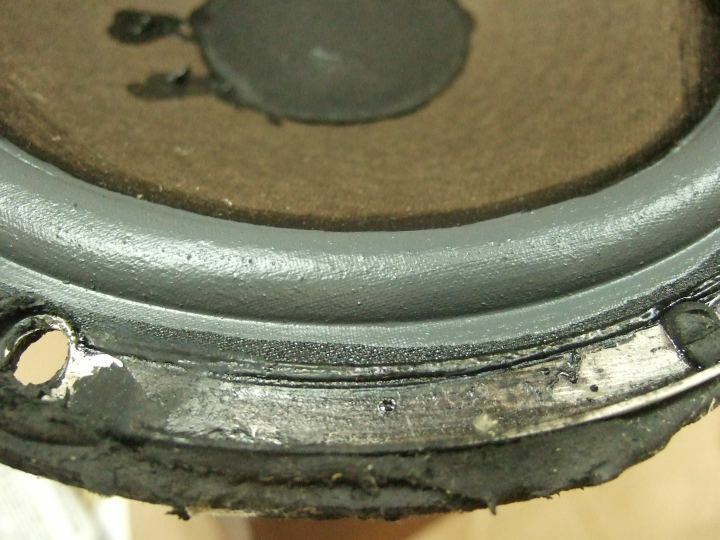 However, the original coating on the AR-cloth woofers was butyl rubber dissolved in xylene or toluene. Of course it was a very low viscosity, thin liquid. One product that might prove useful is their DG-8. However, the text is poorly written. It says "solvent based." All elastomers are dissolved in a solvent. so that phrase tells us nothing. Perhaps we should ask for its MSDS sheet. If it turns out to be butyl rubber, it may be a replacement for "butyl rubber sealant," that is no longer manufactured by Loctite. Then one would thin it to the consistency of water and apply it very sparingly and on only where light is visible through the surround. OOPs already ordered a bottle of the waterbase stuff. Price was right though. Since a have a very young child in the house I am trying to minimise the amount of solvent based stuff I use, so I'll live with the waterbase solution and I'll let some one else try the Butyl rubber. But I'll let the group know how it turns out. I might even test the fs before and after if I get ambitious. >the text is poorly written. It says "solvent based." >tells us nothing. Perhaps we should ask for its MSDS sheet. >where light is visible through the surround. I just talked to the supplier and he informed me that the DG-8 is formulated for bonding the dust cap to the centre of the cone, thus is sets up stiffer than the WD-8 or the BC-8. He suggested that the BC-8 might be very close to what we are looking for and has the advantage of curing tack free and very flexible. He will be sending me the MSDS of both the WD and the BC formulations and I will post them when I get them. I just finished reconing a 15 inch pro woofer. The new cone came with the usual naked cloth surround. I tested the Fs before and after sealing with the Orange County Repair material and there was no change. It's about 43 hz. Obviously higher than most AR woofers, but a data point never-the-less. I'm referring to a solvent as the stuff in which a solute is dissolved. For your solution, latex is the solute, water is the solvent, sorry but that is why the advertisement was meaningless--all these sealers are "solvent based." One certainly wants to let materials with organic solvents dry where we will not breathe their vapors! >meaningless--all these sealers are "solvent based." >where we will not breathe their vapors! Yes that is what I meant, sorry about the incorrect terminology. The last time I popped off the lid to a non-waterbased coating (airplane dope for model RC airplanes) the smell didn't leave the house for days. Nearly turned my hair green. I could have waited for good weather outside, but with the constant rain we have been having, and the colder weather coming, it's just easier to use water base.